On May 3, 2018, Bailey was diagnosed with acute lymphoblastic leukemia. After taking her to a local urgent care as well as a county hospital to try to find answers for unexplained bruising and the onset of what appeared to be a rash, Bailey’s parents were given the new no parent expects to hear. At just two years and four months old, Bailey began her cancer journey at the Cincinnati Children’s Medical Center. 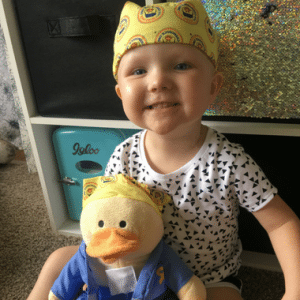 Appropriately named Quack Quack, Bailey’s Chemo Duck has been by her side every single day. Although she is currently undergoing chemotherapy every other week at the hospital and oral chemotherapy every night at home, Bailey discovered after a bone marrow procedure on June 4 that there are no more active cancer cells in her system. Known as a happy girl with a bubbly spirit and an adventurous, talkative and playful personality, Bailey’s spirit continues to shine through every day. Lyndsay is extremely thankful for the support of her family and her community during Bailey’s cancer journey. They have even helped raise money through fundraisers and benefits to help fund Bailey’s treatment. Additionally, Lyndsay could not be more thankful for the special care Bailey received at the Cincinnati Children’s Medical Center. As a mother who has a child undergoing cancer treatment, Lyndsay had some wonderful words of encouragement to share with other parents who have found themselves in this same situation. Thank you to Lyndsay and Bailey for sharing your story with us. We are all rooting for you! This entry was posted in Chemo Duck, Newsletter, Stories. Bookmark the permalink.